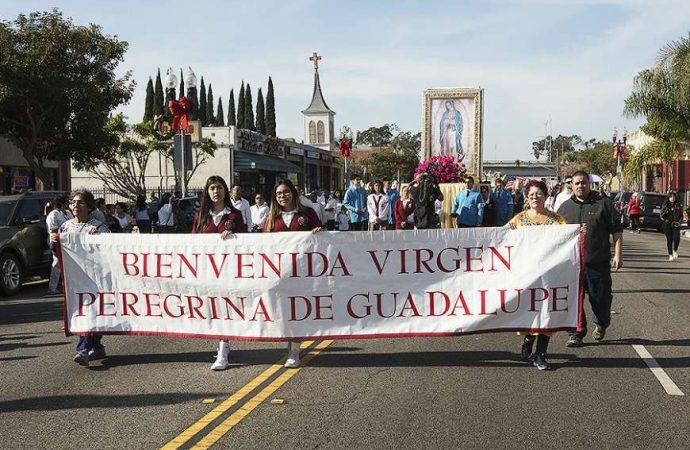 30,000 Catholic people walked the streets of Los Angeles in a Sunday Morning procession for Our Lady of Guadalupe on December 3rd. At the conclusion of the procession there was a Mass celebrated by Archbishop Gomez. “We give our hearts to the Virgin of Guadalupe and we ask her to always intercede for us, to hear us and pray for us,” Archbishop José H. Gomez said in his homily. “To find God, to find Jesus! This is the beautiful role that Our Mother plays,” Gomez said. This is an annual procession and is the oldest religious procession in Los Angeles. 86 years ago Mexican Catholics who fled persecution by the Mexican government during the Cristero war established this procession. It included floats, horses, and native dancers. Children from Catholic schools followed an image of Our Lady of Guadalupe. This was an exact digital production of the original image. The procession ended at East Los Angeles College stadium, where Archbishop Gomez celebrated Mass. He said, “So, today we profess our love for Our Mother. We thank her for her tender love for us – for our children and our families.” At the Mass a survivor of the October Las Vegas shooting was a lector. To prepare for the procession the Our Lady of Guadalupe image visited 20 parishes in the Los Angeles archdiocese and five detention facilities in the Los Angeles archdiocese.